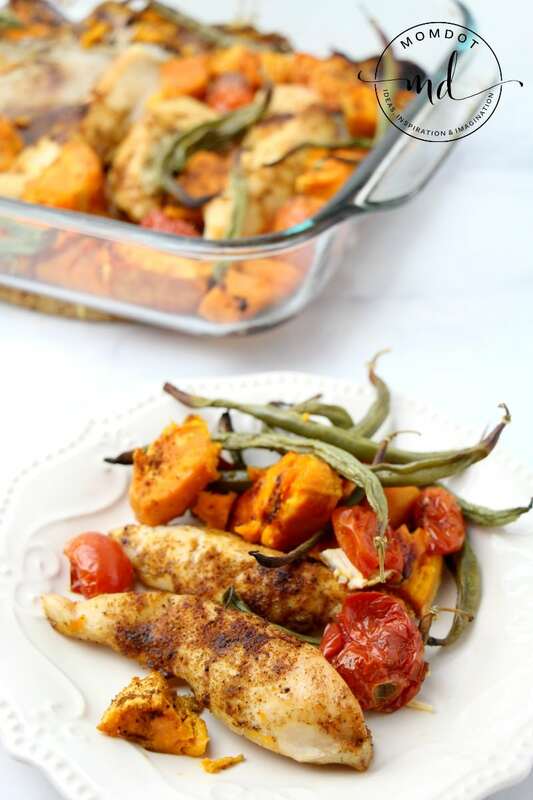 Try a delicious sheet pan chicken is easy to make for clean up and a meal your whole family will love. This simple chicken recipe is easily customizable for all your favorite vegetables, and combining your chicken and side dish will allow your flavors to compliment each other. 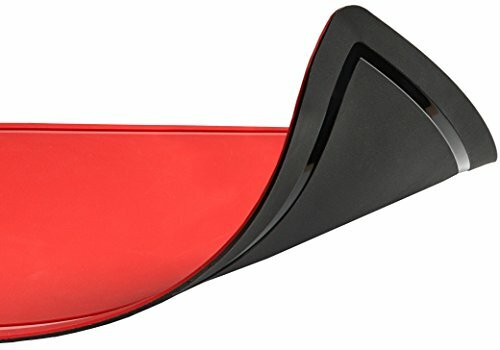 One pan, you cannot beat that! In this dish, I used sweet potatoes, tomatoes and green beans, but this also works for new potatoes, carrots, asparagus and so much more. 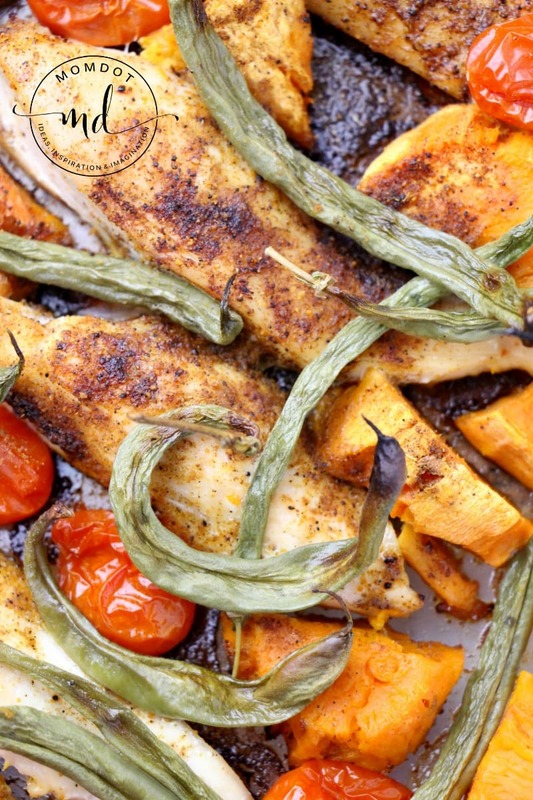 If you love one sheet pan meals, this is your right gig! Ready to get started on tonight’s dinner? 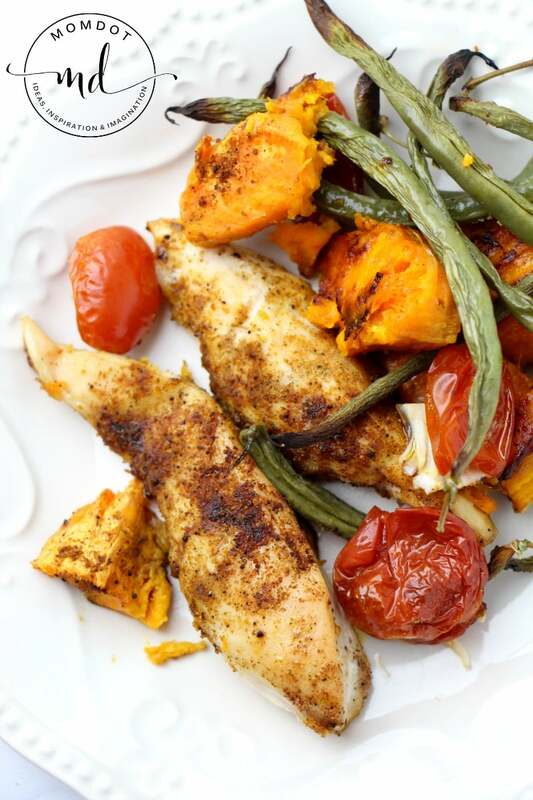 Scroll below for a printable version of this one pan chicken and veggies recipe to make cooking easy in the kitchen. Stab the sweet potato with a fork all over and place in the microwave for 5 minutes, flipping halfway through cooking. This will get it just a bit softened up so everything can cook together in one pan without one thing being overdone and the other being underdone. The potato skin should come off easily with your fingers. Discard the skin and chop the sweet potatos into cubes. Slice the chicken into 1″ wide strips. Place all the veggies ( I like fresh green beans) and chicken on the sheet pan or casserole dish. In a glass measuring cup, combine the olive oil and taco seasonings. Pour the seasoned oil over the veggies and chicken and toss until well coated. 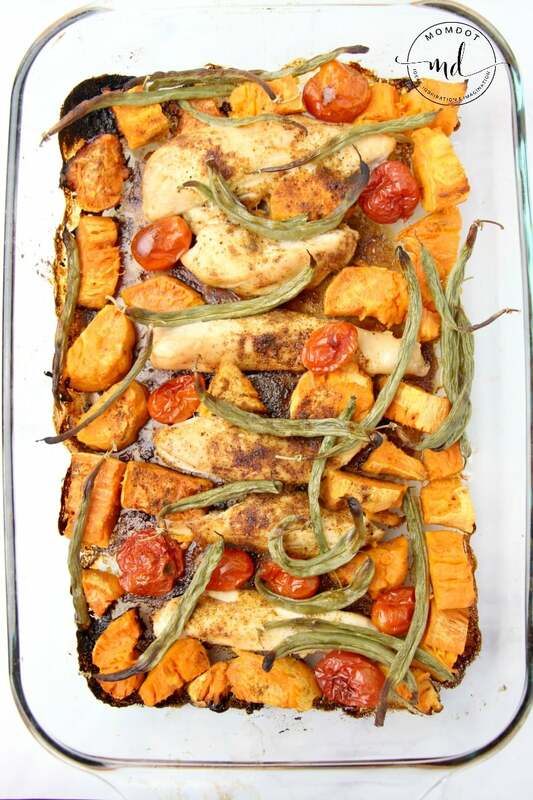 Make sure everything is in an even layer on your sheet pan before placing in the oven. Bake for 25-30 minutes until the chicken reaches an internal temperature of 145F. You can flip halfway through but it’s not necessary. One pan chicken and vegetables for an instant dinner that you're entire family with love. 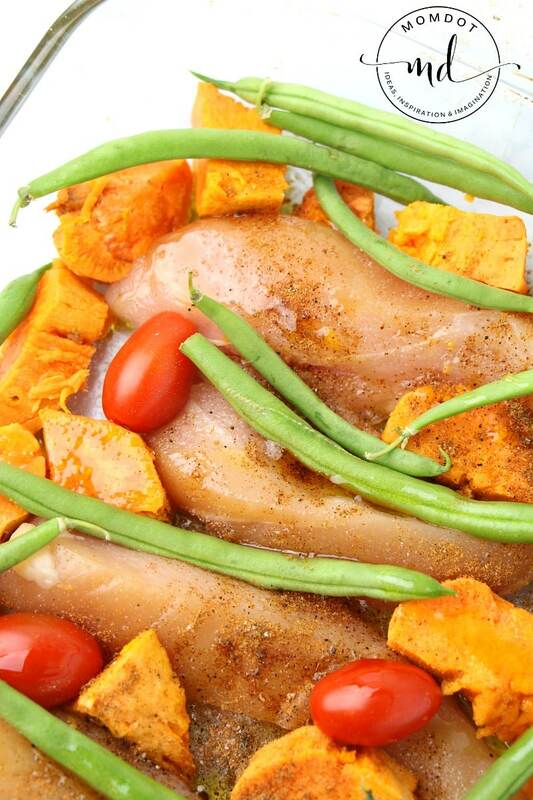 Coordinated with green beans and potatoes, perfectly seasoned chicken pulls this recipe together like a champ! Remove and let cool as you cook the second potato and cut the chicken into strips. The potato skin should come off easily with your fingers. Discard the skin and chop the sweet potato into cubes. Slice the chicken into 1" wide strips. Place all the veggies and chicken on the sheet pan or casserole dish. Pour the seasoned oil over the veggies and chicken and toss until well coated. Make sure everything is in an even layer before placing in the oven. Bake for 25-30 minutes until the chicken reaches an internal temperature of 145F. You can flip halfway through but it's not necessary. 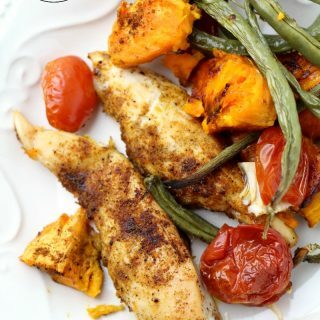 Sheet pan chicken and veggies not your thing tonight and looking for other great chicken recipes? Try Lemon Parmesan Chicken by clicking below.